Wash and clean a whole chicken, trussing the bird. Rub all over with the above paste. To roast the chicken, either use a roasting pan, dish or roasting bags. Sprinkle the fried onions in the dish and place the bird. Cover with foil, or lid and cook in a preheated oven, 350 degrees, for approx I hour 45 minutes or until tender. Cut the roasted chicken into small pieces after deboning. Divide all the ingredients, except the eggs into 2 parts. In an ovenproof dish, make a layer of chicken, sprinkle with tried almonds raisins, chilies and coriander and lastly fried onions. Pour half the cream. Repeat. forming a second layer. Add some of the gravy which has been reserved from the roast chicken. 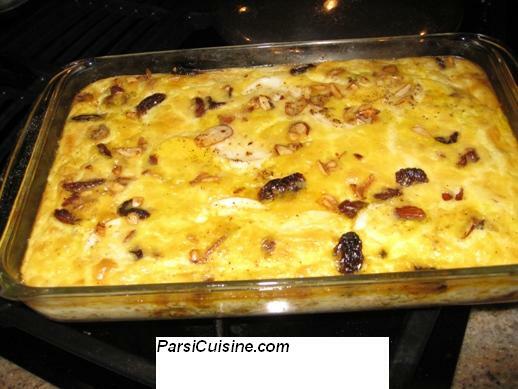 Break the eggs on top of the dish and bake in moderate oven till eggs are set. Alternatively bake the dish first in moderate oven for 20 minutes and then add fried eggs or sliced hard boiled eggs.